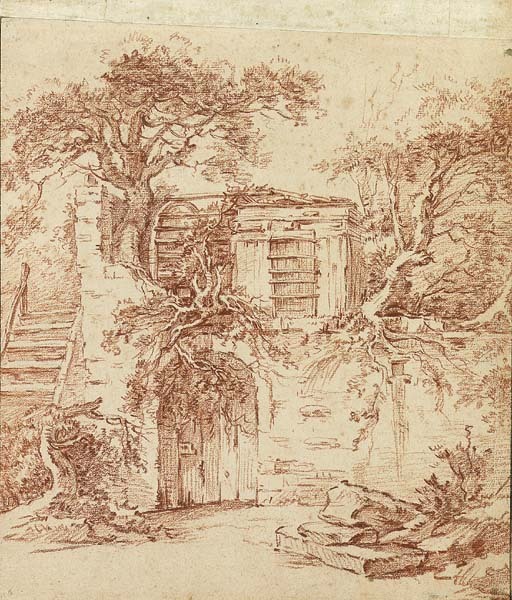 Although finished landscape drawings by Boucher are usually signed, the present sheet may be attributed to the artist on the basis of technique. Alastair Laing compares it to a sheet in the Boymans-van Beuningen Museum, Rotterdam (London, Royal Academy, France in the 18th Century, exhib. cat., 1968, no. 85, not illustrated, but there is a photograph in the Witt Library) in which the treatment of the trees is similar. Two other drawings, broader in outline but with the figures characteristic of Boucher, are in Berlin, Inv. 14914 and 15195, executed in red and black chalk respectively. Eunice Williams suggests that the compressed space within the composition is reminiscent of a stage set and compares it to two pictures, one in the Musée de Picardie at Amiens and another in Munich, in which similar groups of stairways and doorways appear. A. Laing, François Boucher, exhib. cat., New York, Metropolitan Museum of Art, and elsewhere, p. 214, no. 47, fig. 148. These drawings have been dated to the early 1740s. We are grateful to Alastair Laing and Eunice Williams for their help in the cataloguing of this drawing.